Spawn time : 22:00 - 23:30. Terrain type : On the slopes of mountains and rocky outcrops. Pattern : To be defined. 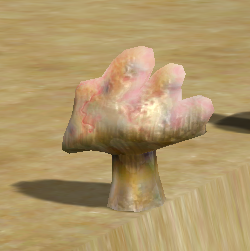 As all Mushrooms, can be used for Cooking. 3 and 21 needed to build a Night tower and its Monumental-sized sister in the Test of Towers. This page was last edited on 18 February 2019, at 17:52.